Introduction: As the population ages, the prevention of falls is an increasingly important public health problem. Balance assessment forms an important component of fall-prevention programs for older adults. 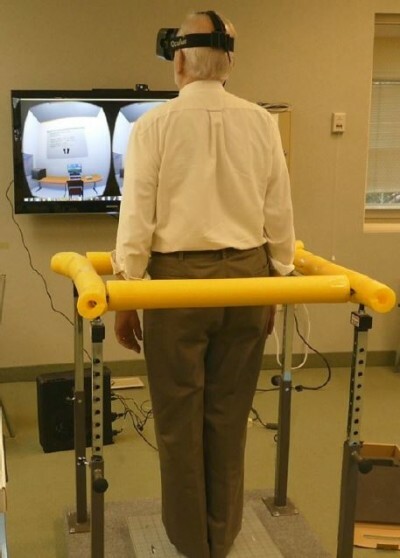 The recent development of cost-effective and highly responsive virtual reality (VR) systems means new methods of balance assessment are feasible in a clinical setting. This proof-of-concept study made use of the submillimeter tracking built into modern VR head-mounted displays (VRHMDs) to assess balance through the use of visual–vestibular conflict. The objective of this study was to evaluate the validity, acceptability, and reliability of using a VRHMD to assess balance in older adults. Materials and methods: Validity was assessed by comparing measurements from the VRHMD to measurements of postural sway from a force plate. Acceptability was assessed through the use of the Simulator Sickness Questionnaire pre- and postexposure to assess possible side effects of the visual–vestibular conflict. Reliability was assessed by measuring correlations between repeated measurements 1 week apart. Variables of possible importance that were found to be reliable (r≥0.9) between tests separated by a week were then tested for differences compared to a control group. Assessment was performed as a cross-sectional single-site community center-based study in 13 older adults (≥65 years old, 80.2±7.3 years old, 77% female, five at risk of falls, eight controls). The VR balance assessment consisted of four modules: a baseline module, a reaction module, a balance module, and a seated assessment. Results: There was a significant difference in the rate at which participants with a risk of falls changed their tilt in the anteroposterior direction compared to the control group. Participants with a risk of falls changed their tilt in the anteroposterior direction at 0.7°/second vs 0.4°/second for those without a history of falls. No significant differences were found between pre/postassessment for oculomotor score or total Simulator Sickness Questionnaire score. Both the force plate and the head-mounted display balance-assessment system were able to detect differences between conditions meant to mask visual and proprioceptive information. Conclusion: This VRHMD is both affordable and portable, causes minimal simulator sickness, and produces repeatable results that can be used to assess balance in older adults.